My step-father has been hinting about wanting meatloaf for a couple of months now. I won’t say it’s every time he comes over, but I hear about meatloaf more from him than I have from anyone else before. I think he’s passive-aggressively asking me to make it. Just go eat some damn meatloaf. To make it easier on him since he’s not necessarily a chef, and my mom hates meatloaf, I decided to record my recipe. I was going to take a white meatloaf over to him after I made this last batch, but it was consumed entirely by my brood. Five children -if they want to eat white meatloaf, you let them. Sorry, man…maybe next time. 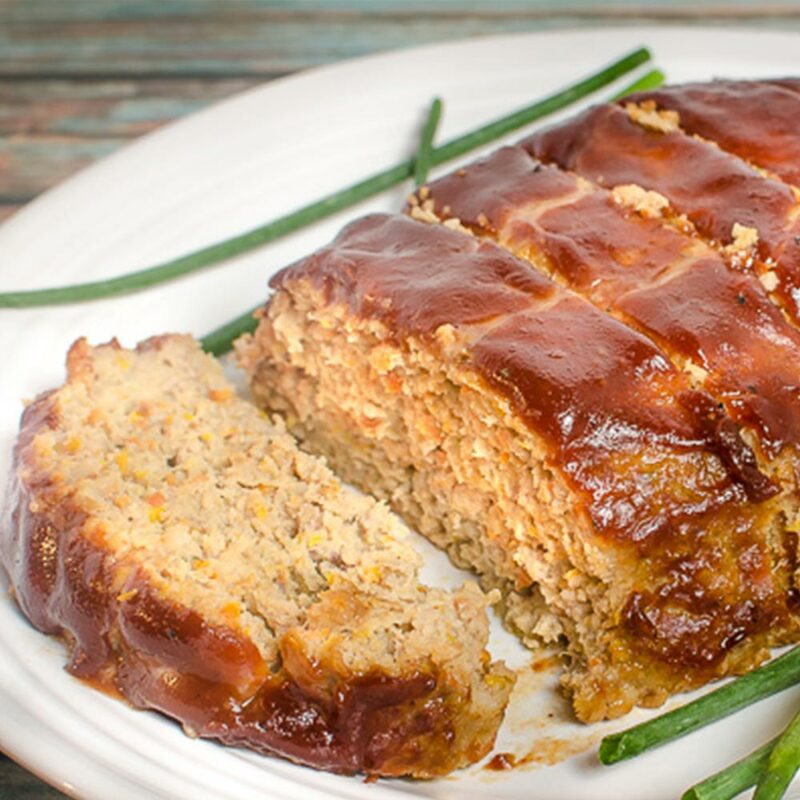 I use turkey, chicken, and sausage (pork) in this white meatloaf recipe. I like the lighter feel it has when compared to beef. The light feel, in my opinion, comes from the leaner white meats. To compensate for the lesser amount of fat, I like to use veggies to juice things up, but I don’t want to eat a chunky meatloaf. That is why I use the food processor and to create a pulp. Use whichever vegetables you have on hand, but I typically always have carrots, onions, and bell peppers. The rest is pretty straightforward: Mix the meat, veggies, egg, Worcestershire sauce (if you don’t have that try soy or some other bold sauce in the same amount), garlic, bread crumbs, and pepper, then form it into a loaf. If you feel up to the challenge, try dividing it into smaller portions using a muffin pan. Who is up for meat muffins? Alright…I’ll work on a better name for that one. Once you have your loaves formed put them in a 350-degree ℉ oven for 30 minutes. While it’s cooking, combine the sauce ingredients ( bbq sauce, ketchup, and mustard). There are a ton of different ways to make the sauce. I chose a quick and easy way that uses ingredients that most people have on hand, plus I am always running low on time. Call it semi-homemade. After the first 30 minutes are up, cover the top of the loaves in your sauce and continue baking for another 30 minutes or until it reaches an internal temperature of 160 degrees ℉. Made with ground turkey, chicken, and pork sausage, this meatloaf recipe is kept moist and flavorful with lots of veggies. Using a food processor, process the carrots, onions, and bell pepper until they reach a pulp consistency. Do not drain. The processed veggies should now measure roughly 2 cups. Combine in a large bowl the veggies, ground turkey, ground chicken, sausage, garlic, eggs, 1.5 cups bread crumbs, Worcestershire sauce, and crushed red pepper. Mix until everything is incorporated and split the meat into halves. Form two loaves and place on a baking sheet. Bake in the 350-degree oven for 30 minutes. While the loaves are baking, in a medium-size bowl, combine the ketchup, barbeque sauce, and mustard. After the first thirty minutes of baking is completed, remove the loaves from oven and cover the tops with the ketchup mixture. Return the loaves to the oven and bake another 30 minutes or until they reach 160 degrees.